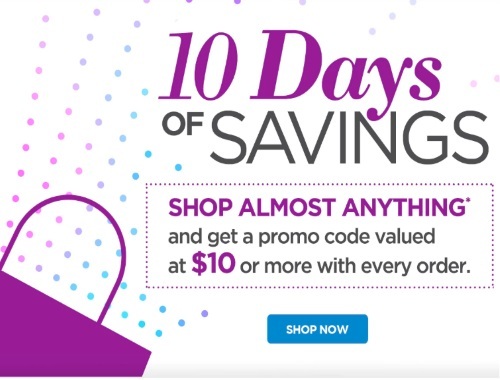 The Shopping Channel has a 10 Days of Savings Event on now! When you shop almost anything you can get a promo code valued at $10 off with every order! 10 Days of Savings Offer Includes all purchases (excluding Gift Cards), during the period of September 30, 2016 10pm ET to October 10, 2016 11:59pm ET. Only one (1) Savings Card valued at $10 or more will be issued per order. Rogers employee discounts cannot be used with this promotion. All “Last Chance Price Final Sale” item sales are final, no returns or exchanges. Savings Cards will be sent to qualifying shoppers by email to the email address on their account, or mailed to the mailing address on their account where no email address exists starting October 17, 2016. Savings cards expire on December 31, 2016 11:59pm ET.